Using metaphors as a heuristic tool, as well as real-life examples, in this paper we investigate the role of translation in ensuring the memory of texts. We argue that translation is not a process that derives a target text from an original, but rather, it generates the text – both the target version and the original – since it gives it new life both in the source and the target polysystems (to use Even-Zohar’s terminology). This is particularly evident when serendipitous mistranslations initiate repertoires of their own, or when translated texts gain more currency than the source text, or express the translator’s/new author’s own style. Employing another metaphor, translation can be seen as a bottle carrying messages across to polysystems that are distant not only in space but also in time, as is the case with so-called archaeotranslations that revive entire canons, or with translations that restore historical events to the collective memory of the sociocultural polysystem they originally took place in. In this metaphor, the message/text becomes as important as, and largely depends upon, the circumstances of translation, such as the sociopolitical situation and norms of translation in force at the time when it was translated. ©inTRAlinea & Rosa Maria Bollettieri Bosinelli & Ira Torresi (2016). "Message(s) in a bottle: translating memory, the memory of translation", inTRAlinea Vol. 18. Translation is entirely mysterious. [...] What is the other text, the original? I have no answer. I suppose it is the source, the deep sea where ideas swim, and one catches them in nets of words and swings them shining into the boat … where in this metaphor they die and get canned and eaten in sandwiches. The watery world evoked by Ursula K. Le Guin in her attempt to unveil the ‘mystery’ of translation certainly points to the uncertainty of the definition of translation itself, in a somewhat Baumanian understanding of ‘liquidity’ (Bauman 2000). If one looks more closely at the extended metaphor in our ex ergo, however, one also distinctly perceives the vitality and creativity of the process of fishing up ideas from a teeming sea using ‘nets of words’ (writing original texts, but also translating them) and processing, ‘canning’ them in order to make them digestible for readers across space and time – perhaps in the form of ‘sandwiches’, as Le Guin says. The process of translation, then, can be seen as an act of weaving networks of words (or net-words, one might say with Ruggieri 2007: 8) in which not only ideas, but also, as we will see, memories, social and translation norms, forgotten languages and historical events get caught and can thus (re)surface to new life. Steiner seems to suggest that a metaphor on translation can be more than ‘a starting point for further theories, a partial view which tells us something, but not everything, about the process it refers to’ as Jean Boase-Beier writes (2010: 28). Boase-Beier, who, incidentally, refers only to metaphors based on the alleged transparency and vicariousness of translation (likened to a window-pane, melting and re-freezing an ice cube, or a ‘staging’ of the text), seems to discard the analytical values of such metaphors on the grounds of their partiality. We have nothing against this implication – unlike translation theories, translation metaphors show no ambition to describe the process they refer to as a whole, but only to shed new light on ‘just one thread of the translating process’, so that as many as possible are needed to reconstruct a reasonably complex – although never complete – overall pattern (Hanne 2006: 221). This is why in the following we choose to discuss two, rather than one, working metaphors, and we are well aware of their partiality. We wish we could explore more, to add more partial views to this Cubist picture of ours, but we are constrained by the legitimate limitations imposed by journal policy and readers’ attention. And speaking of partiality, of course, one needs to bear in mind that metaphors are embedded in cultural specific cognitive domains. This means that the working metaphors we will be talking about are largely the product of our being steeped in Western culture and might not fit other cultural contexts. The first working metaphor that we propose emerged naturally from a brainstorming session in which we intended to explore the reasons why we believed translation could foster the memory of a text. Strangely enough, in our reflection about translation and memory we never came to notions of texts surviving time or ‘living on’ (Brodzki 2007: 5), but rather to ideas of translation as a generative force. We realized right from the start that such ideas could be subsumed by a sort of parent-child relationship between translation and the text itself that was quite unexpected, at least for us. Translation appeared to generate the text and act as its parent, rather than the other way round – and by providing the metaphorical amnios in which the text thrives and comes to life, translation also creates the very possibility for it to be commended to memory. First of all, we reflected, translation enables a text to enter a new world – a new literary polysystem, Even-Zohar (1990) would say. In that polysystem, the untranslated text would simply not be present or would be only marginally relevant, because it would only be known to people who read the source language and come in contact with the text without the mediation of institutional agents. Secondly, once the text begins a separate existence in different polysystems, it might happen that its translated versions become more central to their respective polysystems than the original, thus ensuring the survival of the text even when the source polysystem would provide a hostile environment. A good example of this situation is James Joyce’s Ulysses (1922), whose early translations into German and French (Joyce 1927 and 1929 by Goyert and Morel et al., respectively) obtained huge success – and were used for many early translations into other European languages – at the same time as the original was censored (therefore, not circulated at all) in the US, the UK and Ireland (Lernout 2004: 12). Thirdly, it is quite obvious that once the translated text has entered the new polysystem, it takes on a life of its own, and writes its own history. In Even-Zohar’s (1990) terminology, it becomes a repertoire of its own in the target polysystem, thus generating new interconnections that are not open to the original text but only become possible thanks to translation. This becomes apparent when serendipitous deviations from the letter of the original – what more normative translation scholars than us would call ‘mistakes’ – become standard citations and remain in the mainstream language and culture even after the ‘mistake’ has been publicly exposed. Bible translations offer many interesting examples of such a process. One that is particularly telling is what happened to Moses, who is described in the Old testament as ‘radiant’ (karan), but since in Hebrew vowels are not transcribed, St Jerome interpreted the consonant cluster krn as keren, ‘horn’, thus writing in his Vulgata (Exodus 34.29): ‘ignorabat quod cornuta esset facies sua’ (he ignored that he looked horned). 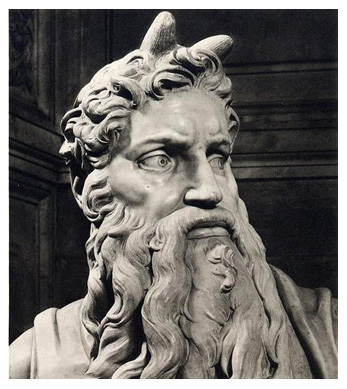 This is why Michelangelo, when he made the beautiful statue that can be seen in the San Pietro in Vincoli church in Rome, crowned it with horns (Fig. 1). Michelangelo’s interpretation of the Latin Bible offers a very tangible example – one that is literally cast in stone – of how a translation can take on a life of its own, different than the original, and generate other works, not only in the target literary polysystem but also, through intersemiotic translation, in other forms of art as well. Another example of the generating potential of translation is the intentional game invented by Eugenio Montale with his Poesia travestita (Poem in disguise, 1999). Montale intended to investigate what would happen to one of his poems in translations into different languages. But unlike the usual process of translating from the same original, he disguised his Italian poem ‘Nuove Stanze’ (New Stanzas) as a poem originally written in Arabic – actually, the first translation in what became a chain, the Arabic being translated into French, the French into Polish, the Polish into Russian, the Russian into Czech, the Czech into Bulgarian, the Bulgarian into Dutch, the Dutch into German, the German into Spanish and finally the Spanish back into Italian. Each translator was unaware that Montale was the original author and that he or she was actually translating from a translation. Needless to say, the final result of this circular Chinese whispers game was pretty much different than the original, but nonetheless a viable text that brought to the surface unsuspected potential meanings that were embedded but invisible in Montale’s original poem. These potential meanings are also generations, ‘children’ that the text would not have had, if it had not been translated in such a provocative and extreme experiment. Poesia travestita, then, is an example of how multiple translations, with their respective interpretations that were only latent in the original source text (see e.g. Senn 1984), can be regarded as a single polyglot macrotext, not unlike the one envisaged by O'Neill (2005) to comprise all Joyce's writings and their translations alike. But there is one last aspect of the translation as generation metaphor that we wish to discuss. Once the translated text takes up a life of its own, then it is also free to accept the cycle of life, which also includes death. In a polysystem, however, just like in nature, dead matter usually fertilizes new life. So it happens that works written in a ‘dead’ language are revitalized by translators/authors who rewrite the originals following their own style and poetics, in fact cannibalizing them. Sometimes in order to ensure the memory of a text, to make it live again, to make sure that new readers find it interesting and pleasurable to come in contact with that text, one must kill it in the first place. Suffice it to mention Seamus Heaney’s translations of Virgil (2001a) and Dante (1979 and 1993), or the Beowulf epic (Heaney 2000). Or Italo Calvino’s Italian translations of Raymond Quenau (1967). Everything we have argued until now challenges the very concept of an ‘original’. The generation metaphor we have employed focuses on translation as a generator of new life that enriches a target polysystem but at the same time revives what is traditionally called the original, giving it new life and relevance within the original polysystem. In this sense we can say that translation promotes the memory of the text in all the languages it is circulated in. And if we accept this view, distinguishing between an ‘original’ and its ‘translations’ seen as its derivatives, or even ‘servants’ of a ‘king’ text (Martin Luther quoted in Wilt 2003: 41), does not have much sense – they are all children that receive life from the translation process (Fig. 2). 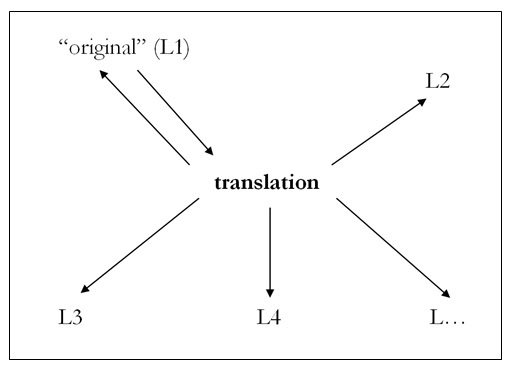 Rather than being at the centre of the picture, the original – or the text written in language 1 – is undoubtedly the starting point of the translation process, but after the translation process has produced other language versions, it becomes just one of the embodiments of the text as it travels across different literary, linguistic and cultural polysystems. The centre and core of this generative model becomes what postcolonial translation studies call the ‘space-in-between’ or the ‘third space’ that is the ‘starting point for interventionist translation strategies’ (Wolf 2000: 141). It is our contention here, however, that all forms of translation, whether or not openly interventionist, always ‘imply a shift towards the centre, where cultures encounter each other, and where meanings are effectively “remixed”’ (ibidem); and that ‘centre’ is the translation-space itself. This image of translation as a shift or travel towards a ‘third space’ brings us to the second metaphor we would like to use as a means to reinterpret translation. We have imagined the journey of the text across different polysystems as the whereabouts of a message in a bottle. This metaphor might at first seem similar to the well-known metaphor of translation as transfer, or as the container that carries a text across languages and cultures (see for instance Halverson 1999). Using the particular metaphor of the message in a bottle, however, produces specific associations that the generic ‘container’ or ‘transfer’ metaphors may not have. Under this metaphor, the producers of the text – its author and translators, but also the translation process itself, as we have just seen – in fact throw the text into the vast sea of reception. The image that immediately comes to mind when we use this metaphor is one of danger: as soon as the text leaves the safe shore it is subjected to the vagaries of readership, since the text has a set of intended addressees but might in fact reach other shores than its producers intended. It is also clear that there is a risk that the text be lost in the tidal waves of editorial fortune. But at the same time, the message in a bottle metaphor leads us to reflect upon what is around the text that accompanies it along its perilous journey. If the text itself can be equated to the verbal message written on the paper inside the bottle, then when it is translated and thrown into the ocean to reach other polysystems it becomes a vessel of memories, a bottle that contains more than one message. The degree of yellowing of the paper, the weathering and opacity of the bottle, the shells and concretions that accumulate on the bottle, the shape, colour and material of the cork, the very air trapped inside the bottle, also become carriers of meaning. At the same time as they ensure the survival of the text, they tell the story of its journey – its origin, and sometimes even the reason why it was put in a bottle. Mapping Tymoczko’s ideas onto our message-in-a-bottle metaphor, such norms can be seen as the air trapped in the glass whose chemical composition, if correctly analyzed, gives information about the place and time when the bottle was corked and put into the sea. Similarly, Tymoczko’s analysis provides invaluable information on the context of production of the translations she focuses on, unveiling the norms that provided the microclimate in which the translation products make sense. Without taking that microclimate into account the piece of paper in the bottle risks not standing the test of time and crumbling to pieces when exposed to an entirely different atmosphere. The metaphor of the message in a bottle is also useful to understand how translation can revitalize texts that have somehow slipped out of the collective memory, even for a long time. An extreme example would be the cases of 'archaeological' translation: entire literary polysystems, once lost to humankind because the language they were written in was forgotten, can be restored to world culture thanks to multilingual translations that include other languages that may be equally dead, but more accessible to scholars. The story of Champollion and the Rosetta Stone is well known: it is thanks to its decoding that we can now have access to texts written in Egyptian hieroglyphs. Perhaps less famous is the story of the inscription found on Mount Behistun, Iran, in the 18th century, and deciphered in mid-19th century, that bore the biography of Persian emperor Darius the Great in three versions of cuneiform writing – Old Persian, which was decoded first, Elamite and Babylonian Akkadian. It is thanks to this trilingual inscription that we can now enjoy access to precious texts such as those of the Gilgamesh saga, the epic story of the king of Uruk written in Babylonian Akkadian some 4,000 years ago and bearing several similarities with the Old testament. Translated for the first time into English in the 1870s, it was retranslated several times and is now a very productive repertoire in polysystems across the world. A Google search ran in November 2013 retrieved a staggering number and variety of texts of different genres bearing ‘Gilgamesh’ in the title or as the name of one of the characters, from Argentinian and American science fiction comics and graphic novels to videogames and Japanese animated series. Think of the wealth of texts that we would not have today if Darius the Great had not thought about translating his own biography into Babylonian Akkadian as well as Old Persian and Elamite. Or if the Behistun inscription had never been discovered and had remained like a bottle containing a message still floating in the waves of lost memory. One other way in which translation can act as a bottle carrying messages across the ocean of memory is when it brings back to the surface past events that risk being obscured or forgotten. In semiotic terms events, too, count as text that can be carried across by translation. It is the case of the short story ‘Dear You’ by Irish author Evelyn Conlon (2013), a narrative account of the life and deeds of Violet Gibson, the Irishwoman who shot Mussolini on April 7, 1926. Mussolini was so humiliated by the fact that he had almost been killed by a woman that he managed to keep the attempt on his life out of the media, and Gibson was not put on trial but segregated in a mental asylum for the rest of her life. Conlon imagines Violet Gibson finding the strength to reclaim her voice for herself and tell her own story, entrusting it to a message in a bottle so that the world that she has lost forever will not forget her fate. Which is, unfortunately, what we tend to do, since the Violet Gibson affair is not often mentioned in the history books that circulate in Italian schools. It is not by chance that Conlon chose to first publish the story in Italy at the same time as its Italian translation, each English page facing its Italian version. In such a way Violet Gibson re-enters Italian culture and historiography, as well as individual readers’ imaginations and emotions, through translated literature. In this short essay we have used two metaphors to explore aspects of translation that may escape more linear, non-metaphorical thinking. In §1 we have seen how translation can be conceived as a generation or filiation process that gives life to texts that are then left free to roam the world of reception, thus giving new life to the ‘original’ in its own turn. In §2 we have discussed the metaphor of translation as the carrier of a message in a bottle, as a process that enables the transmission of knowledge and cultural repertoires across time as well as space, thus bridging temporal gaps that may be so large that all trace of the original text had been lost. Once again, then, the translation process confirms its potential for (re)creating the original at the same time as it creates its translated products. In this sense, translation may truly grant the ‘life and afterlife’ of a text (Di Giovanni 2013; Sinha 2007). Investigating such power through metaphors has proved fruitful in this, however small, exploration of translation in general. Further research along the same lines may provide precious insight. For instance, more in-depth metaphorical investigations of specific case studies may shed new light on trans-creation mechanisms and on the dynamics that link different language versions of the same text. Additionally, the further exploration of metaphors of translation coming from non-Western or non-hegemonic traditions, like the ones evoked by Valerie Heniuk (2010), would invigorate the discussion of metaphors as effective heuristic and analytical tools in translation studies, as well as highlight facets of the translation process that may so far have received little consideration under well-established translation theories. While such investigations remain beyond the space and time limitations of the present essay, we hope that metaphor-driven research gains, and retains, the firm ground it deserves in translation studies, thus contributing to the fertility of the latter as an interdisciplinary field cross-pollinated by the suggestions and ideas of cognitive linguistics and semiotics. Bauman, Zygmunt (2000) Liquid Modernity, Cambridge, Polity. Boase-Beier, Jean (2010) “Who Needs Theory?” in Translation: Theory and Practice in Dialogue, Antoinette Fawcett, Karla L. Guadarrama García and Rebecca Hyde Parker (eds), London, Continuum: 25-38. Black, Max (1962) Models and Metaphors, Ithaca, Cornell UP. Brodzki, Bella (2007) Can These Bones Live? Translation, Survival, and Cultural Memory, Stanford, Stanford University Press. Conlon, Evelyn (2013) “Dear you” / “Caro, Cara”, trans. I. Torresi, Tratti 93: 42-67. Di Giovanni, Elena (2013) “Translation as Craft, as Recovery, as the Life and Afterlife of a Text: Sujit Mukherjee on Translation in India”, TranscUlturAl 5, no. 1-2: 99-115. Evans, Ruth (1998) “Metaphor of Translation” in Routledge Encyclopedia of Translation Studies (1st edition), Mona Baker with Kirsten Malmkjaer (eds), London, Routledge: 149-53. Even-Zohar, Itamar (1990) Polysystem Studies, special issue of Poetics Today 11, no. 1. Guldin, Rainer (2010) “Metaphor as a Metaphor for Translation” in Thinking through Translation with Metaphors, James St André (ed), Abingdon and New York, Routledge: 161-91. ---- (2016) Translation as Metaphor, Abingdon and New York, Routledge. Hanne, Michael (2006) “Metaphors of the Translator” in The Translator as Writer, Susan Bassnett and Peter Bush (eds), Leicester, Leicester University Press: 208-24. Heaney, Seamus (1979) “Ugolino” in Field Work, London, Faber and Faber: 61-4. ---- (1993) Cantos I-III in Dante's Inferno: Translations by Twenty Contemporary Poets, Daniel Halpern (ed), New York, Ecco: 3-15. ---- (2000) Beowulf: A New Verse Translation, New York, Farrar Straus and Giroux. ---- (2001a) “Vergil: Eclogue IX” in Electric Light, New York, Farrar Straus and Giroux: 38-41. ---- (2001b) “Bann Valley Eclogue” in Electric Light, New York, Farrar Straus and Giroux: 12-3. ---- (2001c) “Glanmore Eclogue” in Electric Light, New York, Farrar Straus and Giroux: 42-4. Heniuk, Valerie (2010) “Squeezing the Jellyfish: Early Western Attempts to Characterize Translation from the Japanese” in Thinking through Translation with Metaphors, James St André (ed), Abingdon and New York, Routledge: 144-60. Joyce, James (1922) Ulysses, Paris, Shakespeare and Company. ---- (1927) Ulysses von James Joyce: vom Verfasser geprüfte deutsche Ausgabe von George Goyert, 3 vols, Basel, Rhein-Verlag. ---- (1929) Ulysse, traduction intégrale d’Auguste Morel, revue par Valery Larbaud, Stuart Gilbert et l’Auteur, Paris, Gallimard. Lakoff, George and Mark Johnson (1980) Metaphors We Live By, Chicago and London, University of Chicago Press. Le Guin, Ursula K. (1983) “Reciprocity of Prose and Poetry” in Dancing at the Edge of the World. Thoughts on words, women, places (1989), New York, Grove Press: 104-14. Lernout, Geert (2004) “Introduction” in The Reception of James Joyce in Europe. Vol. I: Germany, Northern and East Central Europe, Geert Lernout and Wim Van Mierlo (eds), London, Continuum: 3-13. Marías, Javier (1992) Un corazón tan blanco, Barcelona, Anagrama. Montale, Eugenio (1999) Poesia travestita, Maria Corti and Maria Antonietta Terzoli (eds), Novara, Interlinea. Queneau, Raymond (1967) I fiori blu, trans. I. Calvino, Turin, Einaudi (French edition 1965, Les Fleurs Bleues, Paris, Gallimard). Reynolds, Matthew (2011) The Poetry of Translation: from Chaucer and Petrarch to Homer and Logue, Oxford, OUP. Ruggieri, Franca (2007) “Foreword” in Joyce and/in Translation, Rosa Maria Bollettieri Bosinelli and Ira Torresi (eds), Rome, Bulzoni: 7-8. Senn, Fritz (1984) Joyce's Dislocutions: Essays on Reading as Translation, John Paul Riquelme (ed), Baltimore and London, Johns Hopkins University Press. Sinha, Raman Prasad (2007) “Life and Afterlife of a Text: Studies in the Concept of Translation” in Random Plurals: Fragments on Philosophy, Aesthetics, and History, Ratnamuthu Sugathan and Kamal Kishor Mishra (eds), Delhi, Anjali Anu Publishers. St André, James (ed) (2010) Thinking through Translation with Metaphors, Abingdon and New York, Routledge. Steiner, George (1992 [1st pub. 1975]), After Babel: Aspects of Language and Translation, Oxford, OUP. Wilt, Timothy (2003) “Translation and Communication” in Bible Translation: Frames of Reference, Timothy Wilt (ed), Manchester, St Jerome: 27-80. Wolf, Michaela (2000) “The Third Space in Postcolonial Representation” in Changing the Terms: Translating in the Postcolonial Era, Sherry Simon and Paul St-Pierre (eds), Ottawa, University of Ottawa Press: 127-46. An earlier, shorter version of this paper was published in Italian in Mirella Agorni (ed) (2014) Memoria Lingua Traduzione, Milan: LED, 17-26. Besides translating Virgil’s IX Eclogue and some of the Cantos of Dante’s Inferno, Seamus Heaney is also renowned for embedding the stylemes of the two classics in his own poetics, for example in the Bann Valley Eclogue and the Glanmore Eclogue (Heaney 2001b and 2001c), and the poem ‘Station Island’ (Heaney 1984). Ira Torresi teaches interpreting between English and Italian at the Dept of Interpreting and Translation of the University of Bologna at Forlì. Her research interests span from advertising translation to representations of gender and (Italian, Italian-American) ethnicity/nationality, Joyce in translation, and Child Language Brokering (interpreting/translation provided by children). In all these fields, she tends to apply social/visual semiotic analytical tools as well as more traditional, verbal-based ones.